The three turbines include: a 100 kW Aquanator™ device, a 150 kW AN-150™ (Nereus™ I) device, and a 400 kW AN-400™ (Nereus™ II) device. 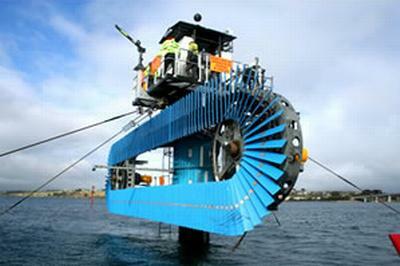 The AN devices are shallow water turbines that have been extensively tested and grid connected at San Remo, Australia. The turbines use Aquafoils™ to capture momentum from the flow of water to drive a chain perpendicular to the flow. The turbines are robust and can withstand water flow containing significant debris. The design is fully scalable and has been developed over a 6 year period with multiple tow-testing and continual optimizations. The device was located in Newhaven Wharf, near San Remo, Victoria, Australia. The Atlantis Resources Corporation began scaled testing in 2002 with ocean based tow-testing programs. In September 2006, a 100 kW Aquanator™ device was installed at San Remo and connected to the national grid. In May 2008, the Aquanator™ turbine was removed from the site and decommissioned. That same month, the 150 kW Nereus™ I, now known as the AN-150™ tidal current turbine was installed and grid connected. By July 2008, efficiency enhancements resulted in the Nereus™ II or AN-400™ tidal current turbine that was tow tested in an open ocean environment at San Remo. The San Remo test site was decommissioned in 2015. The primary shareholder for Atlantis was Morgan Stanley, a US investment bank. In 2008, Atlantis acquired Morgan Stanley’s UK-based marine power project origination and project management business, Current Resources Ltd., renamed Atlantis Resources (UK) Ltd. This acquisition gave Atlantis financial rigor and discipline while allowing the only vertically integrated marine power solution in the market. In over two years of independent testing, Atlantis has recorded zero environmental impact. It has been concluded that the Nereus™ turbine installed at the Newhaven site poses no threat to migrating mammals from an acoustics perspective nor any of the local population of seals and penguins due to the low rpm of the turbine when in operation. Environmental monitoring was collected at the San Remo facility which included assessments of water quality inclusive of salinity, pH, dissolved solids, turbidity, impacts on local flora and fauna as well as noise and vibration monitoring. San Remo is located in Australia.